Mitchell's Coffee House - Lakeland, FL : An independent coffee shop serving gourmet coffee, pastries, lunch and free wifi internet. An independent coffee shop serving Lakeland with gourmet coffee, pastries, lunch and free wifi internet. Since 1998 Mitchell's Coffee House has been serving Lakeland the finest gourmet coffees and pastries. In addition to coffee and delicious baked goods the original location serves lunch on weekdays. Take a moment to review our menu. 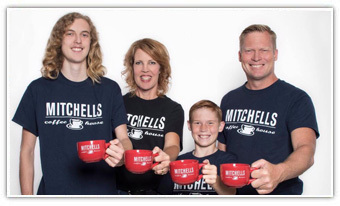 A true independent coffee shop, Mitchell's was founded by the Harvey's in 1998 to fill a much needed void in the community. From the start Mitchell's has featured local artists and original artwork in the store. Each morning Mitchell's is filled with an eclectic mix of local residents, business people, college students and out-of-towners all enjoying the cozy atmosphere and friendly service. Yeah we've got a Facebook thing going as well. Check it out for our events calendar and other stuff. Our main location offers free wireless internet access courtesy of Mitch.